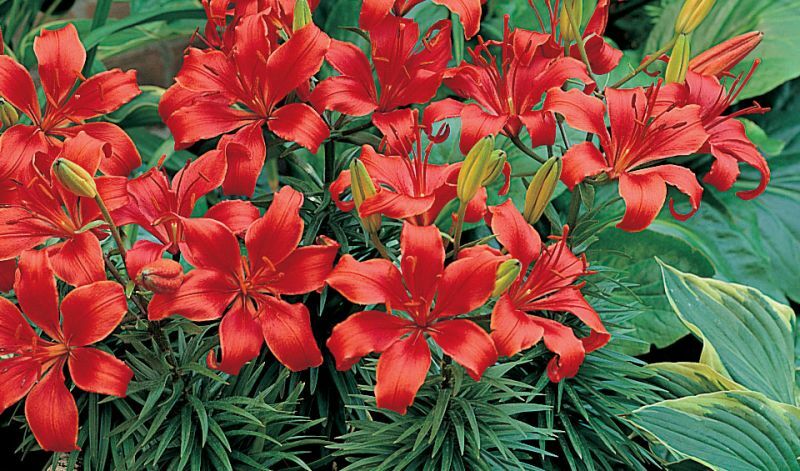 Asiatic lilies are among the earliest to bloom and they are also the easiest of lilies to grow. Medium size plants with upward or outward facing flowers, mostly unscented. Some varieties have beautiful double flowering blooms. Flowers are 4-6" / 10-15 cm in size and can bloom for up to one month in the garden. Available in a wide spectrum of colors from delicate pastels to bold red and orange. 'Brunello' (orange), 'Cappuccino' (white & black), 'Crimson Pixie' (crimson), 'Fata Morgana' (yellow, double), 'Fire King' (orange-red), 'Gironde' (yellow), 'Landini' (black), 'Lollypop' (white & pink) and 'Navona' (white).